You can call me, if you have questions do not hesitate. The prices displayed by the simulator correspond to the off-season price. The price can vary from 60 euros per night (excluding SPA) to 125 euros. Price at the weekend: 260 euros (including SPA) for 2 to 4 people. Holiday weekend price 500 euros for 3 to 4 nights SPA included. Price high season 850 euros the week. In weekend I do not rent the night or so it is possible if available at the last moment price 160 euros. Pretty house for 10 people maximum. My property is very flexible it is possible to rent this cottage with one or two independent rooms and more, if necessary. These rooms are located 30 seconds walk in a part of the neighboring cottage called the DuckFly where is also the relaxation area with SPA and Sauna. All the cottages are totally independent, you will not be disturbed by your neighbors. It is very well placed as close to the sea and the main roads. Central location. Tamerville is 15 minutes from the beautiful landing beaches. 20 minutes from the port of Barfleur (elected the 3rd most beautiful village in France), possibility to make sand yachting in Quinéville or to run with his dog. The house is located in a very quiet little road and not overlooked 2 minutes from Valognes (road RN 13 which is the link Cherbourg - Caen). Valognes is a pretty old town called the little Norman Versailles 15 minutes south of Cherbourg. Perfect for visiting and walking or cycling. Possibility to go get your bread on foot in the morning, at the inn "By the fire" traditional cuisine open lunch ... or be delivered. Sea kayaking in the harbor of Cherbourg or visit the Cité de la mer, or the second highest lighthouse in Europe in Gatteville-le-Phare. local market, flea market, hike in the Hague. There are three coasts to visit. You will find in Valognes all the shops for everyday life (4 supermarkets) 20 min walk or 2 min by car. There is also the big traditional market on Friday morning. You can organize trips in the area such as: the Regional Museum of cider and the Museum of the Eau de Vie and old trades, the Cinema, the Animal Park in Montaigu la Brisette, the golf of the Cotentin peninsula , tree climbing Forest Adventure, The House of the Marshes, the Stables of the Station for a horseback ride, etc. The relaxation area is open 7 days a week and 24 hours a day. This room will be shared with guests of other lodgings if they also take this option but the table will allow you to book your slots schedules desired to privatize this space. The SPA is located a minute walk away, in part of the Voisin cottage called La DuckFly. You will have private access to go there. The SPA (Jacuzzi upscale 6 people) is covered by a pretty glass roof where it is very pleasant to swim protected from the rain overlooking the garden and the terrace. Ability to make packages at attractive prices for these options. A deposit of 500 euros by check will be requested upon arrival. If you do not take the cleaning fee, the price of the cleaning will be asked in cash upon arrival and will be returned to you after checking. A play room with Baby Foot Bonzini and darts is dedicated to the cottage La Grande Duckerie but if it was free during your visit, you can have free access. Pretty house entirely renovated with a extension in wood and a veranda opened on a pretty privative garden which lights up the night with two olive trees, living room of garden, swing and egg cocoon. Bench overlooking the pastures with cows and sheep. This house is an old bakery that was part of the property. It is 80m2 with a bedroom upstairs: a 160cm bed with high quality memory mattress + 2 single beds of 90 cm. This room opens onto a bathroom with bath and separate toilet. On the ground floor: fireplace with large insert, 2 sofa beds BZ + a sofa bed and comfortable chairs. The living room opens to the kitchen with oven, microwave, refrigerator, dishwasher, Senseo coffee pod and all the necessary to cook well and prepare a beautiful table. Central island with 4 high chairs. The veranda can seat around the table 10 people. This room is a strategic place to take a nap, read or play. 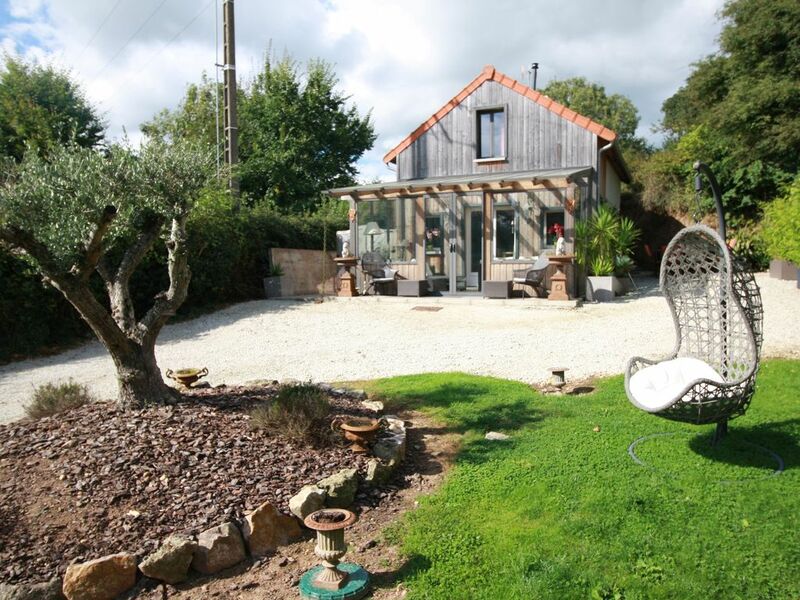 Very nice bright and well decorated this pretty house will be perfect to relax in the countryside and visit the Cotentin. The bakery is facing south, not overlooked with a nice view on pastures with cows and sheep. This cottage also has an outdoor table with chair and Weber charcoal grill, as well as several lounge chairs. Possibility to borrow the ping-pong table of the large cottage which is on the other side if this cottage is free or borrow board games and various novels and tourist books, if necessary. Each cottage has a private entrance with terrace and flower garden, as well as a separate car park. Everything has been arranged so that the cottages can be rented together or individually as needed. Een goede ligging,alles is in t huis te vinden, gezellig ....een aanrader voor grote families of groep vrienden. Nous avions loué l’ensemble des gîtes pour notre mariage, ce qui a permis à nos invités de profiter de la beauté et du confort des lieux. Jennifer et Sébastien ont rendu ce weekend inoubliable. Nous les remercions énormément. Schöne Umgebung, gute Lage. Ruhig ist es aber nur, wenn die Nachbarn nicht gerade Party machen. Das hübsche Häuschen ist vollgestellt mit alten unbequemen Sofas, darauf ist weder das Sitzen noch das Liegen besonders angenehm. In der Küche fehlt es an einigem. Salatschüsseln, ordentliche Töpfe oder ein Korkenzieher waren Mangelware. Duschen kann man eigentlich nur, wenn man nicht mehr als ca. 1.50 misst. Die Wasserhähne sind allesamt gewöhnungsbedürftig und leider war das Häuschen bei unserer Ankunft auch nicht eben sauber. Schade! Maisonnette charmante, décorée avec goût, idéale pour un couple, et l'accueil y est très chaleureux. Idéalement située dans la campagne verdoyante pour se ressourcer, et accessible pour aller à Cherbourg et ses côtes sauvages. Jennifer nous a reservé un accueil très chaleureux et nous a permis de rester le dernier jour jusqu'à 17:00, un vrai bonus!! Les tarifs affichés par le simulateur peuvent être erronés. Merci de me contacter laclefdecamp. f r En week-end je ne loue pas la nuitée ou alors cela est possible mais cela ne changera pas beaucoup le tarif qui sera un tarif pour deux nuits Les week-end férié sont plus cher. Le prix dépend aussi du nombre de gîte ou chambres souhaitez.. Forfait prolongation départ après 11h : 50€ Forfait SPA illimité : 200€ par semaine ou 50 euros pour une nuit Sauna : 60 euros week end ou 120 euros la semaine Ménage : 80 euros Linge lit : 15€ par lit Lit fait a l'arrivée : 10€ par lit Serviette toilette : 8€ Peignoir : 8€ Bois : 20€ par brouette Animaux : 5€ par jour par animal Caution 500 euros par chèque a l'arrivée, svp et 80 euros en espèce si vous ne prenez pas le forfait ménage Il est aussi possible de vous faire un package a un prix plus intéressant qu'a l'unité si cela vous intéresse.